I have not been online much these past couple of months. Clearly I'm writing less. But I've been reading fewer blogs too. The upside is I'm getting a chance to do some old-school-book-reading. 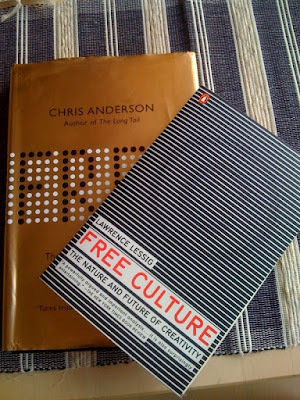 Two of these are Free by Chris Anderson and Free Culture by Lawrence Lessig. Both books get into some of the debates about content, copywrite, creative and the affect of the internet on all of this. They are very different books, coming at this from different angles, but both are well written with clearly articulated arguments. I remember a bit of banter during the summer about Malcolm Gladwell's review of Free but I definitely learned something new from both books. I'd recommend them to marketers. Apologies. The headline is a bit sneaky. The "free" refers to the subject matter, not the price. I bought them both. However, I mentioned both these books before - as both were available at one time for free (or a version of free) in digital format. And may still be. I actually read Lessig's one on my iPhone (via Stanza) but then decided to buy the paper version too (a behaviour Anderson says is common enough). thanks TJ. Useful link and list.